Observation - Tawny Owl juvenile - UK and Ireland. Description: Seeing the recent Tawny Owl posting reminded me of this individual which I spotted on a garden fence in early afternoon whilst walking my dog. Adults heard regularly and seen occasionally at night on a nearby telegraph pole. 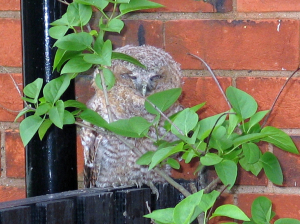 Seeing the recent Tawny Owl posting reminded me of this individual which I spotted on a garden fence in early afternoon whilst walking my dog. Adults heard regularly and seen occasionally at night on a nearby telegraph pole.